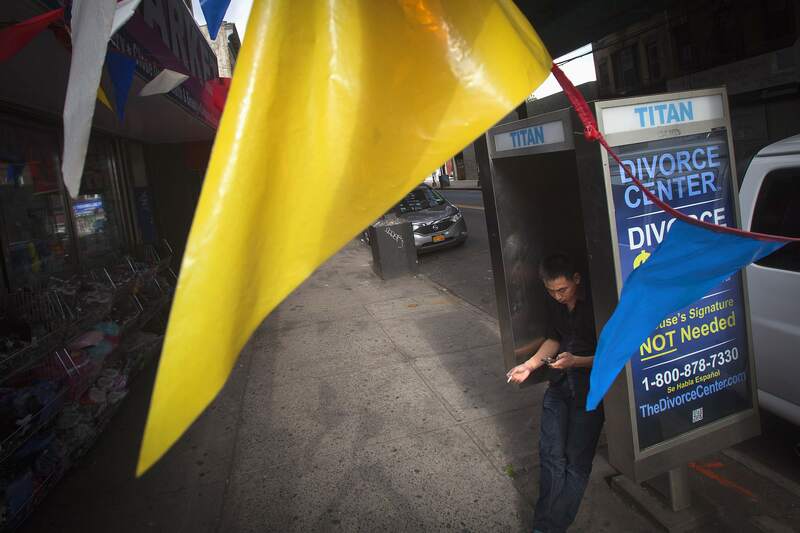 NEW YORK -- The city has scuttled an outdoor media company's project slated to install in payphone booths thousands of transmitters that could track people's movements by sending signals to their smartphones. Titan, which sells ad space in more than 5,000 phone kiosks, had received approval from the city to place the transmitters, known as beacons, in the booths, and 500 had already been installed around Manhattan. The beacons emit a signal that is picked up by smartphones. The technology is most often used to send ads, called push advertising, onto people's cellphones. But the signal, which uses Bluetooth rather than Wi-Fi or cellular signals, could also be used to track the movements of the phones' owners, which would have added to the ever-increasing layers of surveillance installed in the nation's largest city since the Sept. 11, 2001, terror attacks. The proposal was first reported Monday morning in a joint piece published by BuzzFeed News and the Daily News. Hours later, the city announced that it had asked Titan to remove the beacons. "Titan has been an important City partner in helping expand communications options for New Yorkers, from piloting free public WiFi to providing free calling on all its payphones across the five boroughs for three weeks after Hurricane Sandy," said a statement from the city. "While the beacons Titan installed in some of its phone for testing purposes are incapable of receiving or collecting any personally identifiable information, we have asked Titan to remove them from their phones. The beacons will be removed over the coming days." A spokesman for Titan said that the beacons were not intended to track people but it would honor the city's request to remove them. The beacons are expected to be removed in the coming days. Civil liberties groups complained about a possible invasion of privacy and the lack of public discussion over the program. "To the extent that the city is involved in this, the lack of transparency (is) of even greater concern," the head of the New York Civil Liberties Union, Donna Lieberman, told BuzzFeed News. The revelation in New York comes as a similar battle over privacy is being waged on the West Coast. More than a year ago, Seattle police vowed not to turn on a network of surveillance cameras and transmitters to track residents but has yet to publicize a policy as to how they will use the devices. Last month, one of them turned on - police said it was inadvertently - which raised concerns from right-to-privacy groups. A furor has also erupted in London, where an advertising company has installed transmitters in trash cans to track cellphones. And in Washington, several cellphone tracking towers have been spotted around the city, but the identities of their operators remain a mystery.